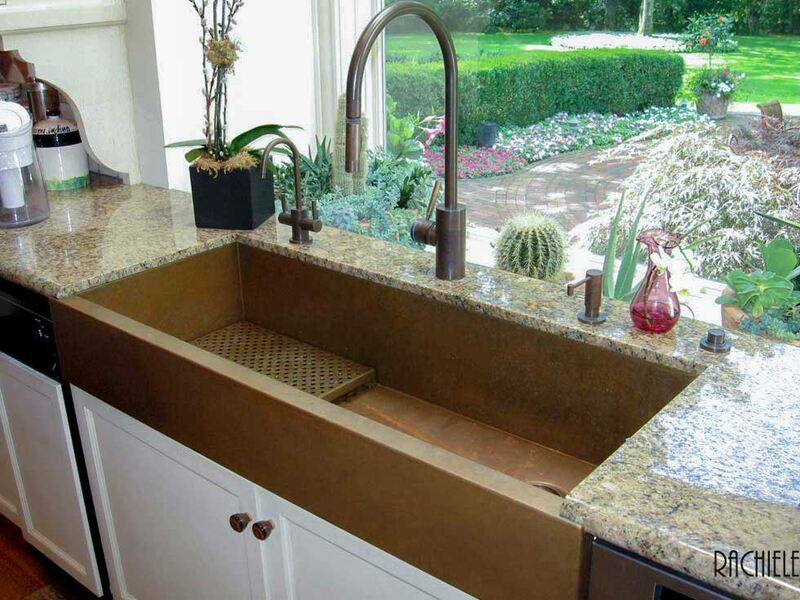 Copper farmhouse apron sink copper patina finish options. 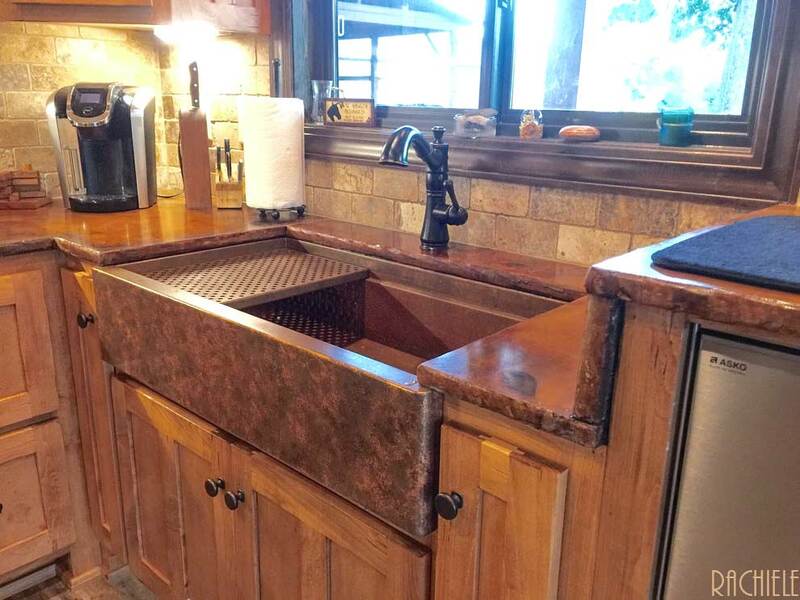 The only sinks that have an option for these patinas are the Copper Farm Sinks.The top mount and under mount sinks will all have our standard easy-care naturally weathered patina (the color of an old penny). All of the apron portions of our farm sinks have a very durable topcoat. We now offer the option of a Semi-Gloss or High Gloss finish. The default will be Semi-gloss unless you specify High Gloss. (There is a premium for the High Gloss finish) No portion of an apron front sink is more critical than the front of the apron. One must have extensive patina experience (we have over 19 years of experience) and we been improving our topcoat regularly over the years. You should consider the experience factor here. There are some companies who have just entered the patina arena with less than a few years of experience. Trust me, top-coat application is critical. Knowing how to use it and what to use has taken us more than a few years to perfect! The initial price may be misleading. Quality isn't cheap! Rachiele copper sinks... the undisputed finest copper sink in the world. Below, find links to the optional patinas available on the Apron portion of our copper farm sink. All of our apron fronts have a very durable topcoat on the vertical surface only. Weathered $120 A simply elegant patina and the fastest option for delivery. Photos do not do this patina justice. This patina is achieved using merely household vinegar. It takes a bit of time and expertise to do this on the apron of the sink, but the rich look is worth the wait! Make sure you look at all three images for the range of color and pattern. Since this is a very organic process, we have very little control over color and pattern. If you look at the third photo down, you will see that one has very little pattern showing. Make sure you click on all images on this page for detail. If you would like more control over the pattern or color, I suggest you select a Rustic patina. I wholeheartedly recommend a protective topcoat on the apron face of a sink only. Topcoats should never be used inside a copper sink. Sadly, most of the Chinese imports topcoat the entire sink. In spite of their claims, there is no topcoat that will not hold up on the inside of a sink. We have experimented with all kinds of finish top coats and have found all to be a problem down the road when used inside a bowl. That is why we never topcoat the inside of our bowls nor the top of the apron. Our weathered patina has so much character and will be unique on every sink. 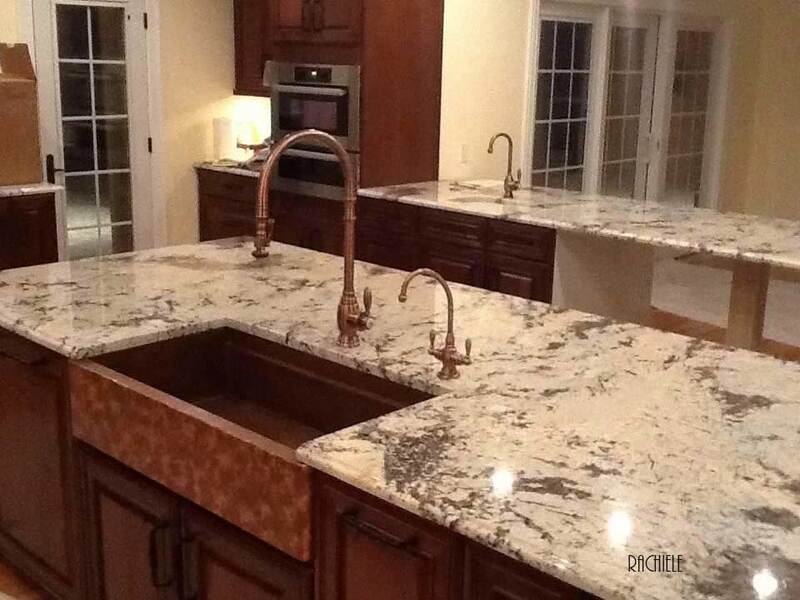 Slight color variations and patterning will designate your sink as a one of a kind. No two are quite alike. Update: September 2017. We are using a new topcoat on the apron of every sink. It has been specifically designed to be even more scratch resistant. We use a two-part catalyzed clear topcoat that is resistant to virtually any solvent. Again, this is only done on the vertical apron portion of the sink. We offer two options for sheen - Semi-Gloss or High Gloss. If no option is discussed, we assume Semi-Gloss. Our experience tells us that our finish is quite durable. That being said, no top coat is indestructible. Much like a car finish, you can scratch it on day one, or you can go 10 years without a scratch. Scratches would not be under warranty with the car factory nor with my sink. I do offer a 3 year limited finish warranty against a defective finish. 90% of past apron damage has been caused by tool belts used by workers in the home. NOTE: Never use any type of tape on the topcoated portion of the apron! I have seen painters tape remove topcoats off of flooring! This is basically a patina with a cloudy pattern of caramel brown with a touch of black. This patina is a very time consuming multi step process. The original weathered patina (top of page) will have a mottled look - little or no cloudy pattern. This patina has swirls and cloud like patterns. I would figure at least a week for this patina - more time required in the winter months. These photos are typical of what you should receive. There will be no photos taken for approval (just like our weathered patina). That helps to keep our cost down. These photos are representative photos of the Weathered ll patina color and pattern range. Hammered copper - shown with a weathered patina: Well, I am not a huge fan of hammered copper as seen on the imports. The imports hammer their copper to hide imperfections. They all look alike. Our hammering looks nothing like the hammering on the imports. Our copper is far to hard to hammer it with such depth. We use a ball peen hammer, not a machine (like many use). This is truly done by hand. Hammering a copper farmhouse copper sink can take upwards of 6 solid hours. So if you like it, we can do it! (You will have to click on the image to see the detail required) We cannot hammer a sink after it is produced, therefore our stocked or ready-made sinks can not be hammered. This a good photo of one of our hammered copper under mount sinks. Make sure you click on the image for detail. Due to the gauge and hardness of the copper we use, the hammering is much different than the imports. 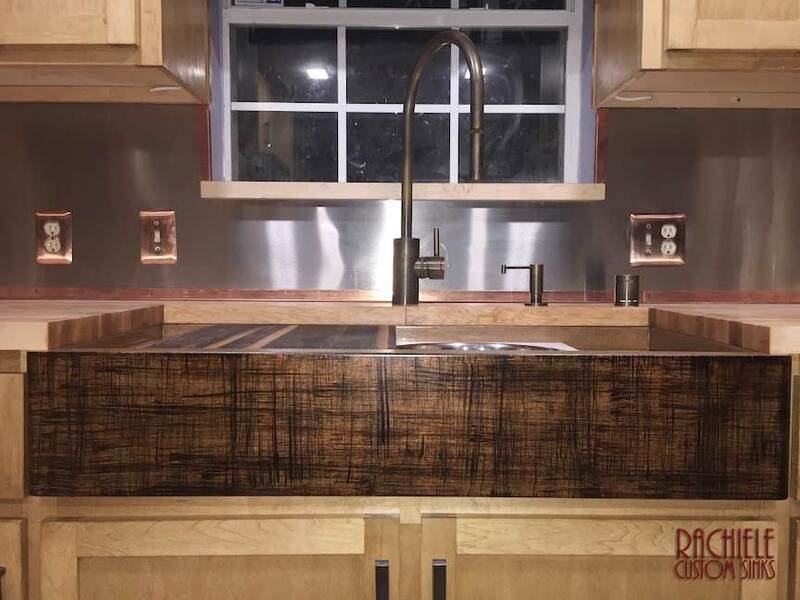 Hammered Signature Series apron front farmhouse sink with a Rustic Patina. A note on hammering. Our hammering is done by hand with a ball peen hammer. Many of the imports use a process that I am unfamiliar with. They generally refer to it as hand hammering - but to me it looks like it was done by machine. Take a look at the imported (from China) brand of sink in a close up video I took. You won't see this kind of detail online from any of the imports! In fact, most web sites do not tell you where the sinks are made. You might notice that when you click on our photos, you get a nice close up detail view. We have nothing to hide. This is our most difficult patina. Colors are difficult to control and we often have to do this patina over and over. We need you to be available when we send a photo. The colors will change drastically very quickly and we need your approval to topcoat as soon as possible. Also, we have noticed that the patina can change after the topcoat process. The change, if it happens, is generally within the first 24 hours. We hold the sink to make sure the patina will not change. If it changes significantly, we may have to start all over - hence the higher cost of this finish. PLEASE NOTE: We have very little control over the colors that form when selecting this particular patina. We use only heat and a mild liquid to achieve these patterns and colors. We cannot guarantee any specific colors will be achieved. 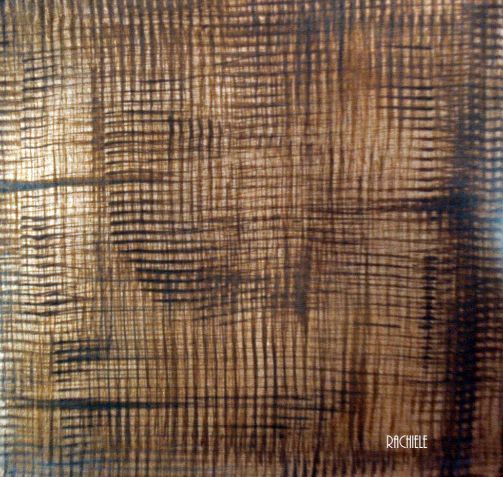 If you would like to see specific colors and patterns, I suggest you select a Rustic Patina. We send photos with the Rustic patina choice for your comments and approval. We will send you a preliminary photo prior to the topcoat process. Keep in mind, the topcoat changes the look of this particular patina significantly. You should be looking at pattern, not color, as the color will change when the topcoat is applied. This is the only finish that I do myself. (I have done all of the Northern Lights patinas until the last one. I showed Lori how to do this patina and she did a great job as usual) We send photos prior to top coating for your approval on this finish. This is a very difficult finish. The end result, however, can be spectacular. Please note - this is a very busy finish. I do not suggest this with a counter, floor or cabinet that has a lot of movement in the design. We send a photo to you before top-coat. Keep in mind, the top-coat has a tendency to mute the colors a bit. Oil Rubbed Bronze patina on apron - a good choice to go with the new Jenn Air Oil Rubbed Bronze appliances. (with a clear topcoat for protection) This sink on the right happens to be hammered on the apron. Please note: we can not hammer a sink that is already made, therefore, our stock sinks can not be hammered. The sink on the left is one of our NexGen Series copper farm sink featuring removable copper drain grid. This patina is similar to our weathered patina, but shows hints of natural copper, giving a warm feeling while showing off that natural color of copper before it ages. This patina has a clear topcoat. We can not send photos prior to top coating, as the copper will continue to age in a matter of minutes and must be top coated quickly. This is another autumn patina on a "Signature Series" copper apron front sink. Keep in mind, patina is a natural process and can not be totally controlled. We do our best to send you a good facsimile of what you see here. This is the Light version of Autumn. Just ask for a light version when you order. If you want to show some of the "New Penny" look, this is the patina to choose. 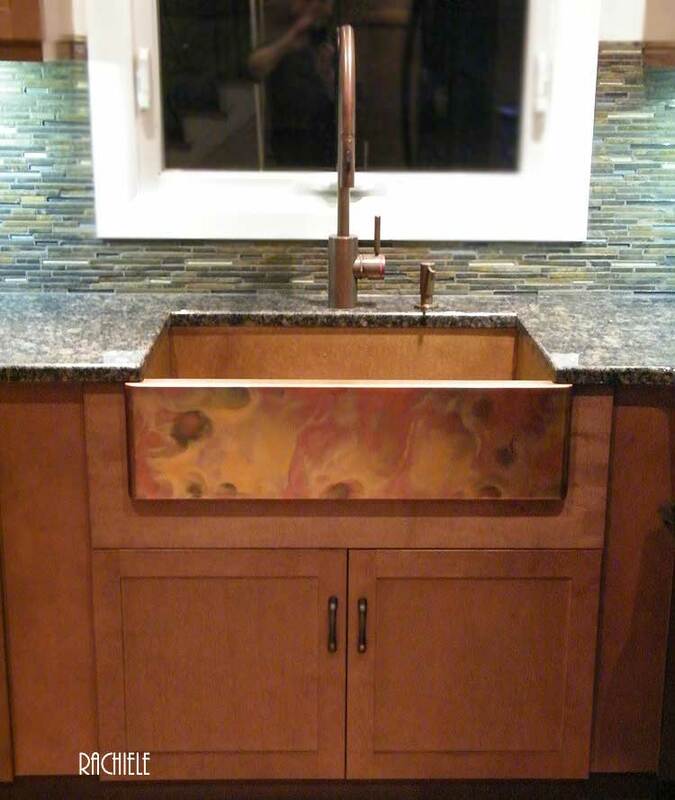 Two of our customers was kind enough to send in photos of their copper apron front sinks featuring an autumn patina. The patina will vary a bit. That is why I have several photos for you to see. Click on the photos for detail. We do not send photos of this patina prior to shipping. An original work of art naturally formed. Now one of our most popular patinas. These patinas can take 1-3 weeks to accomplish - after the sink has been built. To see a huge selection of Rustic Patina options, CLICK HERE. Take a look at this video. It will explain the process of obtaining your original rustic patina. Rustic Patinas ($575) are exclusive to Rachiele. No other company has the knowledge and experience we have to accomplish such amazing patinas on our copper sinks. This is an organic process insuring you will have a unique on-of-a-kind form of art to display in your kitchen. You may choose options such as: color, pattern, and intensity, etc. I will work with you to assist in achieving just the right patina. This is truly an organic process where mother nature reacts with the copper to achieve the different patterns and colors. The results are somewhat predictable, so we can give you quite a variety of options in colors, and intensity. Keep in mind, this patina can take a week to as long as three weeks produce. The process we use to achieve these colors is very expensive and very time consuming. There are very few artists in the world (if any) that have the ability to control these patinas as well as Lori does. The end result is magnificent and truly a one of a kind work of art. We will send you an initial photo for approval or to discuss changes. If changes are required, additional photos will be sent. Since this is an organic process, we can not match a photo exactly, however, we can get quite close to the essence of the photo. 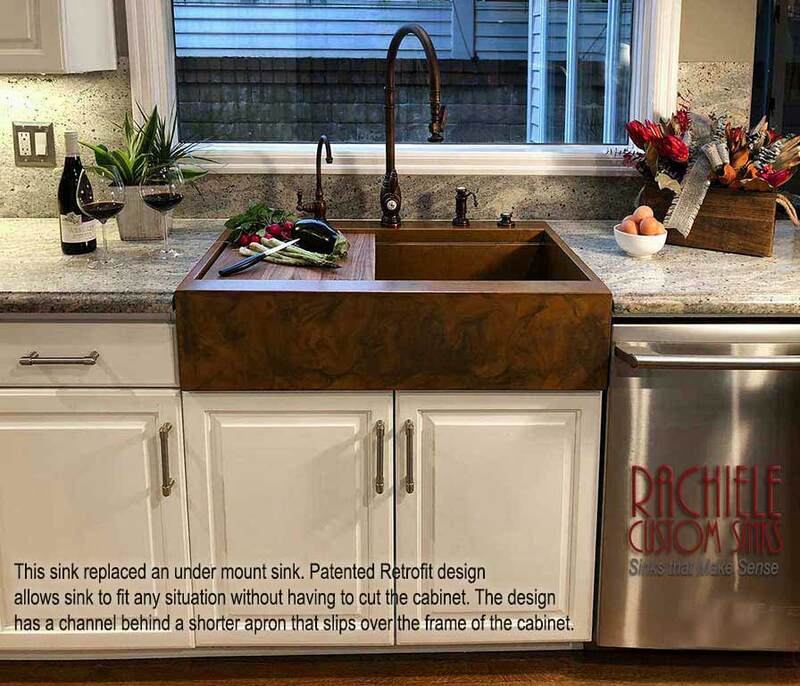 Your sink will be distinctively unique from all other Rachiele sinks. It is very important that you reply to your patina photo emails quickly, as the patina may continue to change and the photo may no longer be a representation of what you saw in the photo. If you alter your choice(s) after we begin the patina process, we do have to charge a change fee. You may have variations of these options. Rest assured, I will be talking to you to get a good feeling for what you would like to see. If you order online, simply select "rustic" then put your choice in the comments section. To see a more varied selection, CLICK HERE. Our Rustic Palettes are somewhat time-consuming and take a great deal of talent to achieve. If you would like to see a larger selection to choose from: CLICK HERE. On that page, the patinas are numbered. Select one, two or three numbers and let us know your choice. We will do our best to produce a one-of-a-kind masterpiece for you. This is a relatively new patina for us that I created after doing a great deal of experimenting. I will likely be the one to produce this patina for a while. The colors are black and different shades of browns and tans. I can see this with a black counter top in granite or soapstone. I have to say I am very excited about this new patina. 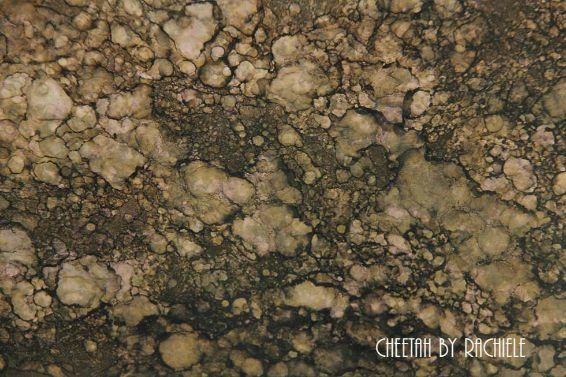 This is the first "Cheetah Patina" on a sink. It was completed early November, 2013. This was a 36" Signature Series Sink. I have been working on new patinas myself (as we keep Lori quite busy). I developed this one that looks very much like cork. It has a blend of light and dark brown tones with a pattern that mimics cork. I have to say, I really like this one quite a bit. You can have a custom stencil - a one of a kind. We send photos prior to top coating for your approval on this finish. You can describe what you are looking for, or use one of these designs. We first come up with a paper pattern and lay it on a sink to give you an idea of the size and shape. You will be working directly with Lori. All stencils are hand cut based on a design you and Lori come up with. Pretty much anything goes. All of the stencils shown would be in the $525 price range. If we have to do a great deal of research to find a design, and the design is elaborate, the fee will increase. Your masterpiece in the kitchen is waiting! Pricing!